Where Will Cargo Pilots Come From in Future? Fast expanding long haul passenger fleets as well as short and medium haul freighter conversions and new orders are a good sign for the airfreight industry. Much of this expansion is geared towards being in a position to tackle the ever growing e-commerce business across the globe. But - who is going to fly all the new machines? Some term them as “flight managers“ - others still use the name “pilot“ to describe those guys sitting in the drivers seat of the world’s enormous fleet of commercial aircraft. The days are long gone when flying cargo aircraft was something seen as being out of the ordinary. The large integrators such as FedEx, UPS, DHL and others, have an enormous amount of cockpit staff on their books. And - these very same integrators continue growing faster than they can hire qualified staff for steering their wide-body aircraft across the skies. They are just one example. Next come the all freighter line carriers. Admittedly, not as many as there were a decade ago, but enough of them with large fleets of B747Fs or the suchlike, which require at least 5 cockpit crews per aircraft. The problem has traditionally been when world markets boom or start to pick up and airlines go on a buying spree and consequently need the two men up front at short notice. Where do you get hundreds of qualified and experienced pilots in China to take the controls of the flood of B757, B737 and B767 freighters which are coming on the market there to serve domestic and South east Asian regional routes. Many, if not the majority will have to come from outside China. Will this then lead to shortages elsewhere? In America for example - this problem exists for some time. There are many smaller cargo operators there who mainly supply the larger carriers, especially the integrators, at their hubs. here, pilot shortages are a daily occurrence with the result that some of these airlines have to cut back services due to their pilots being lured away on more lucrative contracts. Long hours, heavy fatigue factors and lower pay are forcing many of these highly qualified flyers to look elsewhere. 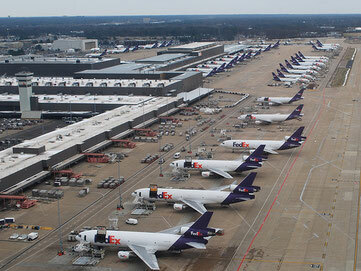 This picture is not just an American aviation problem. The Far East, Europe and now the Middle East are all starting to face the same problem. Middle East carriers continue to grow, expand routes, add new ones and continue ordering long haul jets. They pay well, often far better than their European or American counterparts - so no wonder that there is a pilot migration in that direction. However - it’s not just the migration that’s the problem. Getting suitable young talent in and training them properly is a huge problem. Training cost money and often these aspirants have to shoulder the initial cost themselves. Here we are speaking of costs which can go well over the US$150.000 mark. Maybe carriers have to start looking quickly at how this cost burden can be diluted or even done away with in order to hire and train up suitable candidates to keep those freighters in the air.